Cozy up with the hit video game Call of Duty with this officially licensed throw blanket by Surreal Entertainment! 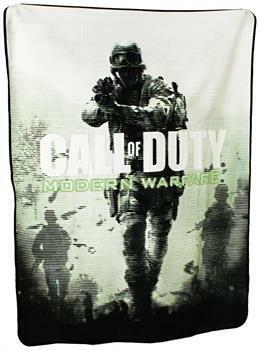 This super-soft fleece throw blanket measures 45" x 60" and features art for Call of Duty Modern Warfare! Machine or hand wash in cold water, air dry. Do not bleach. Cool iron as needed. Sure to make a great gift for your favorite Fallout fan! Blanket measures 45-inches x 60-inches. Quality blanket is made from super-soft fleece. Blanket features art for Call of Duty Modern Warfare! Machine or hand wash in cold water, air dry. Do not bleach. Cool iron as needed.